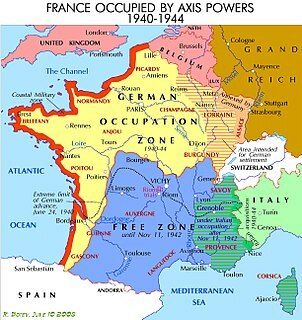 Metropolitan France ( zone libre ) under Vichy control until occupied by the Axis in November 1942 after Operation Torch (with Corsica under the control of Free France in September 1943). Free France and its Free French Forces (French : France Libre and Forces françaises libres) were the government-in-exile led by Charles de Gaulle during the Second World War and its military forces, that continued to fight against the Axis powers as one of the Allies after the fall of France. Set up in London in June 1940, it organised and supported the Resistance in occupied France. The Appeal of 18 June was a famous speech by Charles de Gaulle, the leader of the Free French Forces, in 1940. 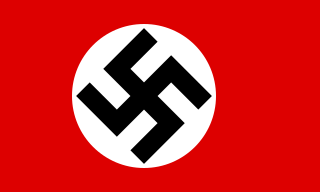 The appeal is often considered to be the origin of the French Resistance to the German occupation during World War II. De Gaulle spoke to the French people from London after the fall of France. He declared that the war for France was not yet over, and rallied the country in support of the Resistance. It is regarded as one of the most important speeches in French history. The French Forces of the Interior refers to French resistance fighters in the later stages of World War II. Charles de Gaulle used it as a formal name for the resistance fighters. The change in designation of these groups to FFI occurred as France's status changed from that of an occupied nation to one of a nation being liberated by the Allied armies. As regions of France were liberated, the FFI were more formally organized into light infantry units and served as a valuable manpower addition to regular Free French forces. In this role, the FFI units manned less active areas of the front lines, allowing regular French army units to practice economy of force measures and mass their troops in decisive areas of the front. Finally, from October 1944 and with the greater part of France liberated, the FFI units were amalgamated into the French regular forces continuing the fight on the Western Front, thus ending the era of the French irregulars in World War II. The Free French fought Axis and Vichy regime troops and served on battlefronts everywhere from the Middle East to Indochina and North Africa. The Free French Navy operated as an auxiliary force to the Royal Navy and, in the North Atlantic, to the Royal Canadian Navy. Free French units also served in the Royal Air Force, Soviet Air Force, and British SAS, before larger commands were established directly under the control of the government-in-exile. The Royal Canadian Navy is the naval force of Canada. The RCN is one of three environmental commands within the unified Canadian Armed Forces. As of 2017, Canada's navy operates 12 frigates, 4 patrol submarines, 12 coastal defence vessels and 8 unarmed patrol/training vessels, as well as several auxiliary vessels. The Royal Canadian Navy consists of 8,500 Regular Force and 5,100 Primary Reserve sailors, supported by 5,300 civilians. Vice-Admiral Ron Lloyd is the current Commander of the Royal Canadian Navy and Chief of the Naval Staff. The zone libre was a partition of the French metropolitan territory during World War II, established at the Second Armistice at Compiègne on 22 June 1940. It lay to the south of the demarcation line and was administered by the French government of Marshal Philippe Pétain based in Vichy, in a relatively unrestricted fashion. To the north lay the zone occupée in which the powers of Vichy France were severely limited. The Army of Africa was an unofficial but commonly used term for those portions of the French Army recruited from or normally stationed in French North Africa from 1830 until the end of the Algerian War in 1962. Some members of the British Cabinet had reservations about de Gaulle's speech, fearing that such a broadcast could provoke the Pétain government into handing the French fleet over to the Nazis,  but British Prime Minister Winston Churchill, despite his own concerns, agreed to the broadcast. In France, de Gaulle's "Appeal of 18 June" (Appel du 18 juin) was not widely heard that day but, together with his BBC broadcasts  in subsequent days and his later communications, came to be widely remembered throughout France and its colonial empire as the voice of national honour and freedom. This would form the essential legal basis of de Gaulle's government in exile, that the armistice soon to be signed with the Nazis was not merely dishonourable but illegal, and that in signing it, the French government would itself be committing treason. On the other hand, if Vichy was the legal French government as some such as Julian T. Jackson have argued, de Gaulle and his followers were revolutionaries, unlike the Dutch, Belgian, and other governments in exile in London. A third option might be that neither considered that a fully free, legitimate, sovereign, and independent successor state to the Third Republic existed following the Armistice, as both Free France and Vichy France refrained from making that implicit claim by studiously avoiding using the word "republic" when referring to themselves,[ citation needed ] even though republicanism had been a core ideological value and central tenet of the French state ever since the French Revolution—and especially since the Franco-Prussian War. In Vichy's case those reasons were compounded with ideas of a Révolution nationale about stamping out France's republican heritage. On 22 June 1940, Marshal Pétain signed an armistice with Germany, followed by a similar one with Italy on 24 June; both of these came into force on 25 June. After a parliamentary vote on 10 July, Pétain became the leader of the newly established authoritarian regime known as Vichy France, the town of Vichy being the seat of government. De Gaulle was tried in absentia in Vichy France and sentenced to death for treason. He, on the other hand, regarded himself as the last remaining member of the legitimate Reynaud government and considered Pétain's assumption of power to be an unconstitutional coup d'état. Initially at least, the Free French forces were drawn mostly from the French colonial empire, rather than from metropolitan France. French nationals from the tropical African colonies formed a large part of the recruiting forces at the beginning, as did nationals from French Algeria following Operation Torch in 1942. Many combatants were drawn from the native populations of French colonies. Natives of Senegal, Morocco, Algeria, Tunisia and other former French African colonies made up a large portion of the French forces, around 56% of the army at the time of Operation Dragoon in August 1944 (134,000 Algerians, 73,000 Moroccans, 26,000 Tunisians and 80,000 men from colonies in black Africa). Additionally, 176,000 men were Pied-Noir, French European settlers in North Africa, 50,000 men were from mainland France (15,000 had escaped France through Spain) and 13,000 Corsicans. From September 1944 onward, the number of men recruited from metropolitan France dramatically increased. In late September 1944, most African soldiers were replaced by young recruits of the French Forces of the Interior to better deal with the cold weather. Bolstered by rapid recruitment from metropolitan France, the number of troops rose from around 560,000 in the summer of 1944 to 1 million by the end of the year and eventually 1.3 million by April 1945. The ethnic composition of divisions varied. The main common difference, before the period of August to November 1944, was Armoured divisions and Armour and support elements within infantry divisions were constituted of mainly white French soldiers and Infantry elements of Infantry divisions were mainly made up of Colonial soldiers. Nearly all NCOs and Officers were white French. Both the 2e Division Blindée and 1er Division Blindée were made up of around 75% Europeans and 25% Mahgrebians which is why the 2e Division Blindée was selected for the Liberation of Paris. The 5e Division Blindée was almost entirely made up of white Frenchmen. Records for the Italian campaign show that both the 3rd Algerian Infantry Division and 2nd Moroccan Infantry Division were made up of 60% Mahgrebians and 40% Europeans while the 4th Moroccan Infantry Division was made up of 65% Mahgrebians and 35% Europeans. The three North African divisions had one brigade of North African soldiers in each division replaced with a brigade of French Forces of the Interior in January 1945. Both the 1st Free French Division and 9th Colonial infantry Division contained a strong contingent of Tirailleurs Sénégalais brigades. The 1st Free French Division also contained a mixed brigade of French Troupes de marine and the Pacific island volunteers. The Division also included the Foreign Legion Brigades. In late September and early October 1944, both the Tirailleurs Sénégalais brigades and Pacific Islanders were replaced by Brigades of troops recruited from mainland France. This was also when many new Infantry divisions (12 overall) began to be recruited from mainland France, including the 10th Infantry Division and many Alpine Infantry Divisions. The 3rd Armoured Division was also created in May 1945 but saw no combat in the war. 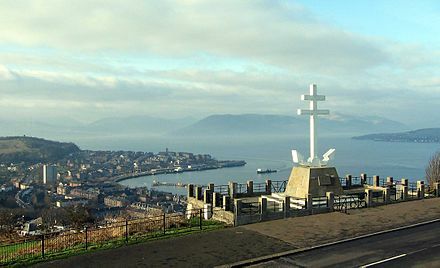 A monument on Lyle Hill in Greenock, in the shape of the Cross of Lorraine combined with an anchor, was raised by subscription as a memorial to the Free French naval vessels which sailed from the Firth of Clyde to take part in the Battle of the Atlantic. It has plaques commemorating the loss of the Flower-class corvettes Alyssa and Mimosa, and of the submarine Surcouf. Locally, it is also associated with the memory of the loss of the destroyer Maillé Brézé which blew up at the Tail of the Bank. In total[ citation needed ] during the war, around 50 major ships and a few dozen minor and auxiliary ships were part of the Free French navy. It also included half a dozen battalions of naval infantry and commandos, as well as naval aviation squadrons, one aboard HMS Indomitable and one squadron of anti-submarine Catalinas. The French merchant marine siding with the Allies counted over 170 ships. France also had possessions in Asia and the Pacific, and these far-flung colonies would experience similar problems of divided loyalties. French India and the French South Pacific colonies of New Caledonia, French Polynesia and the New Hebrides joined Free France in the summer 1940, drawing official American interest. These South Pacific colonies would later provide vital Allied bases in the Pacific Ocean during the war with Japan. In North America, Saint-Pierre and Miquelon (near Newfoundland) joined the Free French after an "invasion" on 24 December 1941 by Rear Admiral Emile Muselier and the forces he was able to load onto three corvettes and a submarine of the FNFL. The action at Saint-Pierre and Miquelon created a serious diplomatic incident with the United States, despite this being the first French possession in the Americas to join the Allies,  which doctrinally objected to the use of military means by colonial powers in the western hemisphere and recognised Vichy as the official French government. Mainly because of this and of the often very frosty relations between Free France and the USA (with President Roosevelt's profound distrust of de Gaulle playing a key part in that, with him being firmly convinced that the general's aim was to create a South-American style junta and become the dictator of France  ), other French possessions in the new world were among the very last to defect from Vichy to the Allies (with Martinique holding out until July 1943). De Gaulle's influence had also grown in France, and in 1942 one resistance leader called him "the only possible leader for the France that fights". Other Gaullists, those who could not leave France (that is, the overwhelming majority of them), remained in the territories ruled by Vichy and the Axis occupation forces, building networks of propagandists, spies and saboteurs to harass and discomfit the enemy. 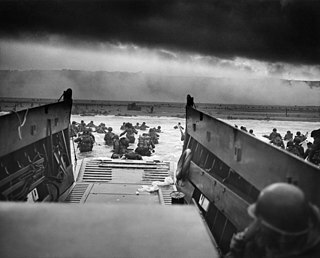 By the time of the Normandy Invasion, the Free French forces numbered more than 400,000 strong. 900 Free French paratroopers landed as part of the British Special Air Service (SAS) Brigade; the 2e Division Blindée (2nd Armoured Division or 2e DB)—under General Leclerc—landed at Utah Beach in Normandy on 1 August 1944 together with other follow-on Free French forces, and eventually led the drive toward Paris. The invasion was preceded by weeks of intense resistance activity. Coordinated with the massive bombardments of the Transportation Plan and supported by the SOE and the OSS, partisans systematically sabotaged railway lines, destroyed bridges, cut German supply lines, and provided general intelligence to the allied forces. The constant harassment took its toll on the German troops. Large remote areas were no-go zones for them and free zones for the maquisards, so-called after the maquis shrubland that provided ideal terrain for guerrilla warfare. For instance, a large number of German units were required to clear the maquis du Vercors, which they eventually succeeded with, but this and numerous other actions behind German lines contributed to a much faster advance following the Provence landings than the Allied leadership had anticipated. The Allied High Command (SHAEF) requested the Free French force in question to be all-white, if possible, but this was very difficult because of the large numbers of black West Africans in their ranks. General Leclerc sent a small advance party to enter Paris, with the message that the 2e DB (composed of 10,500 French, 3,600 Maghrebis   and about 350 Spaniards  in the 9th company of the 3rd Battalion of the Régiment de Marche du Tchad made up mainly of Spanish Republican exiles  ) would be there the following day. This party was commanded by Captain Raymond Dronne, and was given the honour to be the first Allied unit to enter Paris ahead of the 2e Division Blindée. The 1er Bataillon de Fusiliers-Marins Commandos formed from the Free French Navy Fusiliers-Marins that had landed on Sword Beach were also amongst the first of the Free French forces to enter Paris. The military governor of the city, Dietrich von Choltitz, surrendered on 25 August, ignoring Hitler's orders to destroy the city and fight to the last man. Jubilant crowds greeted the Liberation of Paris. 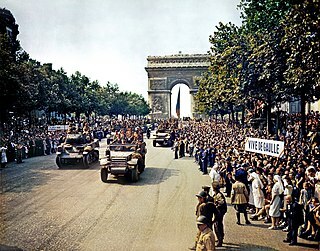 French forces and de Gaulle conducted a now iconic parade through the city. As the wartime government of France in 1944–1945, its main purposes were to handle the aftermath of the occupation of France and continue to wage war against Germany as a major Ally. It also made several important reforms and political decisions, such as granting women the right to vote, founding the École nationale d'administration , and laying the grounds of social security in France, and lasted until the establishment of the IVth Republic on 14 October 1946, preparing its new constitution. By September 1944, the Free French forces stood at 560,000 (including 176,500 White French from North Africa, 63,000 metropolitan French, 233,000 Maghrebis and 80,000 from Black Africa). The GPRF set about raising new troops to participate in the advance to the Rhine and the invasion of Germany, using the FFI as military cadres and manpower pools of experienced fighters to allow a very large and rapid expansion of the Armée française de la Libération. It was well equipped and well supplied despite the economic disruption brought by the occupation thanks to Lend-Lease, and their number rose to 1 million by the end of the year. French forces were fighting in Alsace-Lorraine, the Alps, and besieging the heavily fortified French Atlantic coast submarine bases that remained Hitler-mandated stay-behind "fortresses" in ports along the Atlantic coast like La Rochelle and Saint-Nazaire until the German capitulation in May 1945. In May 1945, by the end of the war in Europe, the Free French forces comprised 1,300,000 personnel, and included around forty divisions making it the fourth largest Allied army in Europe behind the Soviet Union, the US and Britain. The GPRF sent an expeditionary force to the Pacific to retake French Indochina from the Japanese, but Japan surrendered before they could arrive in theatre. In his liberation of Paris speech, de Gaulle argued "It will not be enough that, with the help of our dear and admirable Allies, we have got rid of him [the Germans] from our home for us to be satisfied after what happened. We want to enter his territory as it should be, as victors", clearly showing his ambition that France be considered one of the World War II victors just like the Big Three. This perspective was not shared by the western Allies, as was demonstrated in the German Instrument of Surrender's First Act. The French occupation zones in Germany and in West Berlin cemented this ambition. The French State, known as Vichy France, proclaimed by Marshal Philippe Pétain after the Fall of France in 1940 before Nazi Germany, was quickly recognized by the Allies, as well as by the Soviet Union, until 30 June 1941 and Operation Barbarossa. However France broke with the United Kingdom after the destruction of the French Fleet at Mers-el-Kebir. Canada maintained diplomatic relations until the occupation of Southern France by Germany and Italy in November 1942. ↑ Horne, Alistair (1969). To Lose a Battle; France, 1940 (2007 ed.). Penguin. p. 604. ISBN 978-0141030654. ↑ Alexander, Martin (2007). "After Dunkirk: The French Army's Performance Against 'Case Red', 25 May to 25 June 1940". War in History. 14 (2): 226–227. doi:10.1177/0968344507075873. ISSN 1477-0385. ↑ Jackson, Julian (2018). A Certain Idea of France: The Life of Charles de Gaulle. Allen Lane. pp. 110–111. ISBN 978-1846143519. ↑ Horne, Alistair (1962). The Price of Glory; Verdun 1916 (1993 ed.). Penguin. p. 150. ISBN 978-0140170412. 1 2 3 Munholland 2007, p. 10. ↑ Shlaim, Avi (July 1974). "Prelude to Downfall: The British Offer of Union to France, June 1940". Journal of Contemporary History. 3. 9 (3): 27–63. doi:10.1177/002200947400900302. JSTOR 260024. ↑ The Guardian , "A Mesmerising Oratory", 29 April 2007. ↑ de Gaulle, Charles (28 April 2007). "The flame of French resistance". The Guardian. London. Retrieved 27 March 2010. 1 2 Munholland 2007, p. 11. ↑ Jackson, Julian (2001). France: The Dark Years, 1940–1944. Oxford University Press. pp. 31, 134–135. ISBN 978-0-19-820706-1. ↑ Axelrod & Kingston, p. 373. 1 2 Pierre Goubert (20 November 1991). The Course of French History. Psychology Press. p. 298. ISBN 978-0-415-06671-6 . Retrieved 6 March 2011. 1 2 Axelrod & Kingston, p. 362. ↑ Jennings, Eric T. Free French Africa in World War II. p. 66. 1 2 Benjamin Stora, " L'Armée d'Afrique : les oubliés de la libération ", TDC, no 692, 15 mars 1995, Paris, CNDP, 1995. ↑ "It was they, the Africans who came from afar by Benjamin Stora". histoirecoloniale.net. 18 June 2006. Retrieved 18 June 2006. 1 2 "Le bataillon d'infanterie de marine et du Pacifique, the military Units – Museum of the Order of the Liberation". 1 2 "Liberation of Paris: The hidden truth". The Independent. 31 January 2007. Retrieved 31 January 2007. ↑ Gilles Aubagnac, " Le retrait des troupes noires de la 1re Armée ", Revue historique des armées, no 2, 1993, p. 34-46. ↑ "The Cross of Lorraine from charles-de-gaulle.org". Archived from the original on 2006-05-02. Retrieved 2015-10-25. ↑ "War Memorials". Inverclyde Council. 9 August 2017. Retrieved 9 November 2017. ↑ Jordan, John and Robert Dumas (2009), French Battleships 1922–1956, p 77. ↑ Bimberg, Edward L. (2002). Tricolor Over the Sahara: The Desert Battles of the Free French, 1940–1942. Contributions in military studies (illustrated ed.). Greenwood Publishing Group. pp. 23–26. ISBN 9780313316548. 1 2 Munholland 2007, p. 15. ↑ Hastings, Max, p. 81. ↑ Hastings, Max, p. 403. ↑ Martin Thomas, "The Discarded Leader: General Henri Giraud and the Foundation of the French Committee of National Liberation," French History (1996) 10#12 pp. 86–111. ↑ deRochemont, Richard (1942-08-24). "The French Underground". Life. p. 86. Retrieved 2011-11-20. ↑ Axelrod, Alan; Kingston, Jack A. (2007). Encyclopedia of World War II, Volume 1. Facts on File Inc. p. 363. ISBN 978-0-8160-6022-1. ↑ Talbot, C. Imlay; Duffy Toft, Monica (2007-01-24). The Fog of Peace and War Planning: Military and Strategic Planning Under Uncertainty. Routledge, 2007. p. 227. ISBN 9781134210886. ↑ [ dead link ] 1940–1944 : La France Libre et la France Combattante pt. 2 Archived 16 December 2008 at the Wayback Machine (in French). Charles de Gaulle foundation official website. ↑ [ dead link ] 1940–1944 : La France Libre et la France Combattante pt. 1 Archived 16 December 2008 at the Wayback Machine (in French). Charles de Gaulle foundation official website. ↑ "France Excluded from the German Capitulation Signing by the Western Allies" Archived 29 September 2011 at the Wayback Machine . Reims Academy. ↑ Robert Jeffrey (November 6, 2014). Scotland's Cruel Sea: Heroism and Disaster off the Scottish Coast. Black & White Publishing. p. 21. ISBN 978-1-84502-887-9. ↑ "Sarkozy Marks Anniversary of General de Gaulle's BBC Broadcast". BBC. 17 June 2010. Retrieved 9 September 2017.